The private finance initiative (PFI) contract for the Inverness Airport passenger terminal has been bought out by the Scottish Executive for £27.5m. The deal requires operators Highlands and Islands Airports Ltd (HIAL) to cover a tax liability of £8.4m. This takes the full bill to more than £36m. It is understood the terminal cost £9.6m to build. Ministers said the eventual price for the PFI deal, which was scheduled to run until 2024, would have been £73m. 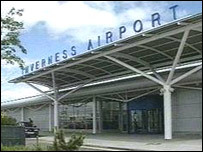 The terminal had been owned by Inverness Airport Terminal Ltd (IATL). Under the PFI deal IATL, owned by investment company I2, provided facilities in return for passenger charges. But the arrival of no-frills airlines meant airport operators had to accept little growth in landing charges. Income from other areas at Inverness Airport, such as retail and parking charges, went to the PFI operator. Inglis Lyon, managing director of HIAL, a state-owned company which operates nine other airports in the north and west of Scotland, said the buy-out meant it would no longer be financially penalised for increasing passenger numbers. He added: "It also unlocks the potential for us to bring Inverness Airport into profitability, thus eliminating the need for revenue subsidy from the Scottish Executive in the future. "By funding this buy-out, the Scottish Executive has shown great commitment to the long-term development of a major driver in the regional economy." Transport Minister Tavish Scott said removing the PFI contract would have a major impact on the Highland economy and allow Inverness airport to attract new airlines and set up new routes. "I look forward to the passenger numbers, airlines and economic activity growing as a result of this change," he said. "Inverness is an exciting, vibrant city - Scotland's fastest growing city - and the change will help in the development of Inverness and the surrounding area."